Is Airbus hiding a new A322 business case behind the 100t+ A321XLR study? Numbers..
Airbus has been looking at an A322 stretch since the late nineties. Things have changed. 20 years ago, an A321 with 4700NM range or 240 seats was not on the radar Market demand, MTOW growth and new engine technology changed the picture over the years. With A300/310, Boeing 57 and 767 fleets getting real old, airlines are knocking the doors for efficient medium range capacity. A meter of A320 family fuslage weighs around 600-800kg. The A321LR has an empty weight of around 97t. If the MTOW is increased by e.g. 4t it becomes around 101t. If that MTOW is maintained for an A322 version of say 4 meters, 2.8t is consumed by additional empty weight. An additional 4 rows/ 24 passenger /luggage would come in at 2.4t. 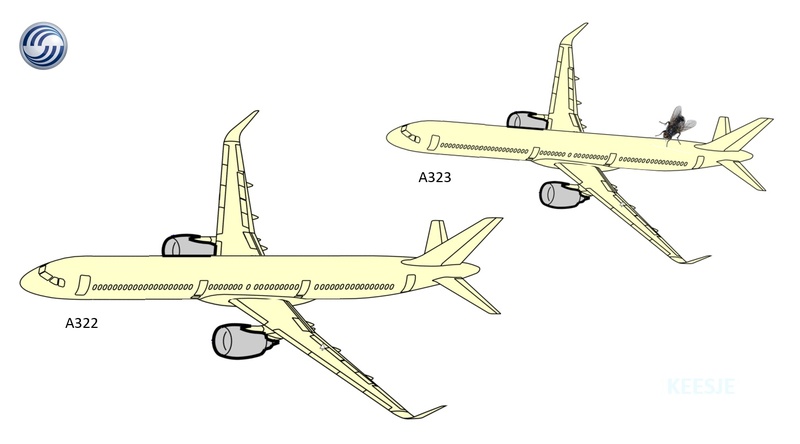 The A321LR has an advertised range of 4000NM with 164 passengers, as Bjorn Ferm sketched: https://imagr.eu/up/0GAt7_PR-diagram-1024x588.png. A MTOW bump of 4t for an A321XLR/A322NEO probably translates in a payload bump of 1.2t for an A322. You have to use the added capacity. Theoretically you could go above 260 seats high density, but if we assume a 200 passenger 2 class payload, that results in a useful range of 3000-3500NM. JFK-LAX is 2200NM, 3000NM is probably covering 90% of all commercial flights. With 250 seats single class, 2500NM should be doable for an A322. If the fuselage is lengthened for a A322 by 4m, that would mean the tail section be lengthened by approximately 1.5m. That will result is a reduced maximum lift-off angle, which mean a slightly higher V1, longer runway etc. a thrust bump of 3-4k lbs on the engines could solve this and seem foreseen in the PW1100 and LEAP-A. Apart from that, the A321 has never been a runway hog, it seems for most operations a marginal longer runway requirement would not be a serious restriction, if they can handle 739/10s too. The market seems to be asking for 250 seats medium range, if Boeing and Airbus are to be believed. If an A322 is included in the ongoing A321XLR study, using the same MTOW, engines, LDG, wings, fuel system, additional investment and risks would not seem prohibitive. The markets in the US, Asia and Europe seems extensive for cheap, up to 250 seat aircraft. CASM would probably be real competitive compared to bigger twin aisle aircraft. Re: Is Airbus hiding a new A322 business case behind the 100t+ A321XLR study? Numbers.. It looks profitable but I think this aircraft is really only good for short routes as it has 240 pax with just two toilets and half a galley. That's really cutting things fine and it might lack the flexibility to be used on longer routes. I think that it makes sense. Airbus have always creepingly increased the MTOW on their models. A minimal change configuration A322 with slightly higher MTOW should be appealing to many airlines that can sacrifice some range for more capacity. In addition, Airbus could also offer the higher MTOW on an A321 fuselage and increase the payload-range of the current A321 to make TATL more payload efficient. Currently the payload restriction is not insignificant on westbounds. Runway performance can suffer but this is hardly an issue in today's world. The aircraft that will have "240 pax with just two toilets and half a galley" will be A321 not any hypothetical A322. I has 3 lav's and front galley capacity. Looking at what Airbus offers on the 240 seat A321, 264 seats could be fitted. But a 4th lavatory, reasonable pitch in front etc, optimal crew numbers (1:50) would probably keep seat count just under 250, even with LCC's. For longer flights, mid cabin lavatories would be considered, creating galley / crew space in the tail galley. Like on the 757-300's. It can hardly be an accident that the new revised door arrangement on the A321neo can be certified for 250 pax -as stated by Airbus themselves.That of course would be for LCC only.But the way that market is exapanding and embracing the A321neo it is a logical 'final step'. As above in a two class layout this will drop to 220-225 ish pax dependant on layout. As for range reduction and total weight? 101 tonnes seems to be about right.There has to be a pavement loading max near there ..Range reduction?It's hard to tell but as long as it can go transcon in all weathers then there is no need for more really (it won't do TATL). People tend to talk about the possible A322 and the possible 797 in the same breath but they are really not the same market at all.One can tell this simply from required engine thrust.Most recent reports have the 797 engine thrust requirement from Boeing set at 52klbs ( but apparently those 2klbs have been ignored for the purposes of continuing with the Cfm partnership).The 320/737 family thrust requirements are ( I believe) max 31klbs.ie Entirely different.So clearly a very different mission profile(s).Not really competitors ( I note MOL also recently said the same). Some time ago the A320 family had optional four-wheel main gears on each side. Could this be helpful for heavy weight A321neo-versions again? Unless that space is earmarked for the new conformal fuel tanks. Is the A321 really so much less expensive to operate than an A330-200 (or -800)? I know one's a NB and the other's a WB. IMHO, Airbus will not open their cards on A322 until Boeing firms up 797. Otherwise they may undercut themselves. If Boeing goes stupid and launches a "MoM", they'll make an A322 and kill it with price. If Boeing starts a clean sheet 737 replacement, they'll invest in a clean sheet A320 family and kill that. No friendship, love or respect unite people as much as shared hatred. Higher purchase/lease price, MUCH larger engines, MUCH higher ground fees for higher MTOW, wider gate requirements due to longer wings... What else? More tires. All in all, I believe it's MUCH more expensive to operate. But what if they put an A300/310 fuselage on A321 LDG with A330neo electronic suite? THAT would be a great plane!!! They may even grandfather the type certification! Isn't the engine requirements (50klbs) indicating a much bigger heavier capable frame - more indicative of just under the 330-200? Thx mjoelnir for the correction on thrust.But it's still (imho) a huge difference in thrust suggesting quite different operational projections. Airbus should sit on their hands and not launch anything until Boeing's elusive 797 comes to light. Only then will they know if a stretched/re-winged 321 will be enough or if they need something more substantial. - A321 / A322 new projects all imply stretching the fuselage, adding wheels to support higher MTOW, developing new engines to fit the requirements; will all those developments imply such a high developement cost that a brand new A321 / A322 will cost less to buy in the first place than an A332 / A338 but not as much as being really convenient? I mean, if 240 pax are squeezed in an A321 / A322, and 280 pax is a typical A332 / A338 high density load, will those 40 pax pay out the purchasing faster than A321' / A332's derated engines / NB fuselage advantages? - ground fees: A321 / A322s are targeted to LCCs and ULCCs, if I understand right. Those Carriers prefer always secondary airports because of lower ground fees. So isn't better to have a bigger plane, where you can squeeze more passengers and cargo, and land in a secondary airport, than to have a smaller plane, that can hold less pax and cargo, but lands / takes off on a main hub? Thanks for all the kind answers. Airbus are in a very decent place to be with the A320 family. They basically can't crank them out quick enough right now. They have to take into account that spending lots of money on an upgraded A321neo or an A322 stretch will take away a slot from an already developed A32Xneo of some kind. They would be foolish not to be studying options, of course, but they don't need to make decisions until Boeing decide what they're doing with the hypothetical 797 'MOM' aircraft. Bigger versions = bigger margins and bigger revenue. I think it is partly psychological warfare against any Boeing configurations and sizes that need to be decided about now for MOM and similar. We're talking about quite some price difference. $259M list price for A330neo vs. $130M for A321. (Airlines pay a lot less but since we don't know how much, we have to stick with the list prices.) Let's imagine each A322 will be $170, even then it's almost half the price. There is a topic here called Aircraft values. It lists the lease fees for both A321 and A330. Find it (I couldn't) and check it out for yourself. There is also a very serious issue of residual value. Selling an A321 if you don't need it anymore will be a breeze. Selling an A330-200 will be... let's say, interesting. Proof that low-costers don't need A330-200 is in the number of A330-200 parked in the desert. If there was demand, they'd be snapped quickly. Whereas finding a spare A321 would be... let's say, interesting. I'm not sure LCCs are as interested in cargo capacity as the "legacy" airlines, but I may be wrong. Plus smaller airports usually don't have well-developed cargo terminals that are necessary to fill the bellies of large aircraft. But a much bigger problem for smaller airports is that they are... small. If you take, for example, Beauvais Airport located "near Paris" (if you believe Ryanair), it has a 2,400-meter runway. A330-200 needs 300 more to take off. Luton has an even shorter runway at 2,100m, etc. To use a larger and heavier plane you need a larger airport with a longer runway. And that means higher ground fees. What i don't understand is if there is such a demand for a MoM plane to fill the gap why Boeing hasn't just started producing the 757 again. The development is already done. All they'd have to do is update the engines and call it the 757Max. That would less be the case, if a A322 opens up a market not served with A321s and threathened by future NMA sales. E.g. longer TATL flights that do not justify a WB, or new routes during their initial start-up phase. A hypothetical A322 with a lower density cabin / lower payload, e.g. 178 seats, could fly close to the same routes as the A321LR today. You can actually type your question into the Search field and get about 1,000,000 answers. My take on this is, (a) nobody wants the 757 and those who wanted it bought it, (b) nobody wants a "MoM", and (c) nobody knows what they want. Airlines these days want something unrealistic. Qantas wants to fly 300 pax from Sydney to London. Emirates want 5,000-seat A380 with two engines. They are all so obsessed with "saving" and "cutting costs" that they completely lost connection with reality AND with what they're actually doing. Cutting costs has become a fetish for shareholders and an indicator of the CEO's and board's effectiveness. And numerous examples of cutting costs making more damage that the costs themselves don't seem to stop this hysteria. Like what? What possible routes can that open or support in the initial phase? It's not 1934, all routes that could be opened have been opened... and most of them closed already. I just cannot see what possible city pairs you're talking about. A picture from a website with a very interesting name - parallel welten. We know it is possible. We also mostly know Airbus shelved work on significant A321neo upgrades 8 months ago and refocused on a more simplified MTOW upgrade (despite some people refusing to accept this). When will that program be unshelved? Yesterday, today, or tomorrow? Only the Airbus Executive leaders know the answer to that, but we can debate it ferociously if we please. Take it as you may. But the lack of communication from Airbus on a "true" 797/MOM competitor tells me one thing: Boeing is nowhere near close to final specs on the 797/MOM, and most likely doesn't even know where to position it (single or twin aisles, closer to 737 or 787, mid or long range, etc...). If the specs for the 797/MOM were already out there to the airline CEO's, Airbus would have already countered with their own paper plane. I wonder which phantom plane has a bigger fan club? The 797 or A322. Then the windshield 'mask' is definitely a 'must' to complete the getup. Airbus are likely doing the opposite of their public statements. They have at least one 'black' development centre in France (perhaps another in Germany). We can be confident Reuters don't get press releases on current activities. They have at least one 'black' development centre in France (perhaps another in Germany). We can be confident Reuters don't get press releases on current activities. Lockheed has Skunk Works, Boeing has Phantom Works, what trendy name does Airbus have? Alas these divisions were mostly for secret military projects. The A322 would never fit there since They have leaked plenty of information through Leeham News and we have seen a dozen images of it with a housefly signature. Last edited by Newbiepilot on Tue Dec 04, 2018 7:49 pm, edited 1 time in total. Airbus are likely doing the opposite of their public statements. I’m sorry but I don’t buy into The Whole conspiracy theory logic that we shouldn’t believe executives when they talk about what their companies are doing since it is all a deceptive shell game to throw off the competition. Of course Airbus R&D is always working on new things and strategies change, but I tend to believe corporate strategies shared executives. Evolving strategies over time is not the same as don’t the opposite of their public statements. People keep saying "they can't build them fast enough" or things along those lines. If Airbus did offer a stretch of the A321, be it the 5 meters or so to get it to the same size as the 757-200 or an additional stretch to 757-300 size, the A320NEO would lose out the most. The A321 would probably see a small drop in orders and probably some customers switching from A321 to a more expensive A322 or A323. So far, most of the 737-10 orders are upgrades from 737-9 orders. Had Boeing the ability to get it higher off the ground to both add larger engines AND a higher takeoff rotation angle, the 737-8 would be cannibalized with the 9 and 10 being the more popular models. The MOM needs 2 models. One that is between A321 and 757-300 size and one that is between 767-300 and 767-400 size. An A322 and A323 could theoretically satisfy the low end of this market while some iterations of the 797 would satisfy the top end. Is it efficient? Probably not, but I don't think both manufacturers are going to spend billions more than they have to, to satisfy both segments of an MOM aircraft portfolio. Airbus would be silly if it didn't at least consider stretching a 101 t A321. With that in mind, I'm not sure there will actually be a business case. The 101 t A321neo is for a fairly extreme and specific set of missions, which really aren't well served by any other existing equipment (only the 797, a paper airplane, can even compete in theory). The A322 would be competing on an easier-to-handle set of missions where it will be competing for the most part against more frequency with smaller narrowbodies. The A322 will be significantly underwinged for its weight, which may affect its efficiency on those missions to some degree. This is speculation--it's hard to know exactly what the numbers would be--but it's easy for me to imagine that three A322s might not bring much advantage over four A321neos or 737-10s. Right. When have we ever seen a plane launched that came out of nowhere? I agree here...an A322, if a narrow-body, could allow for thinner missions in the 3000-4000 nmi range (even if the range is as long as 4700 nmi) with more premium seating...and the ability to carry belly cargo. Airlines like Delta could see a business case for that to replace the 757s with Delta One and also open additional thin routes (the Delta One fleet is limited to the former TWA and Shanghai Airlines 8-door birds, plus an additional ex-AM bird acquired later on); United could also use it to replace the pmCO 757s and carry belly cargo there. Outside of the USA, airlines such as IndiGo could also make use of this model instead of acquiring a wide-body...and have 3 classes of seating...same for Lufthansa and Eurowings (such as replacing the A343 from DUS-JFK with an A322 and maintain some BizClass seats, although losing BEST), or even VIE-JFK under Eurowings, as a replacement for the 767 passenger version. While there would be a reduction in capacity, there would also be a reduction in costs to operate and a new product could be offered in 3 classes: a true J product, a true W product, and a Y product (with the ability to change to a denser configuration)...not unlike what Copa is offering on its MAX 9s. This could right-size routes like JFK and YYZ to VIE and allow the resumption of routes like JFK to TXL/BER or other thin Germany routes (on Eurowings) that cannot support a wide-body, like HAM or STG. Also for an airline like LH or SN, this could broaden the Africa network massively. Turkish Airlines could also use such a model to get almost all of Africa with narrow-body planes. In the South Pacific, all of the major airlines could use the A322 on routes not to slot-restricted airports. Thank you for spending so much time digging up all those old posts But, I assume, you missed something changed. Airbus indicates they are working on a 100t + derivative. The kind of development some easy believers thought was confirmed ”shelved”. The A322 that you are proposing sounds an awful lot like the A320neo plus plus that was shelved. Nothing you posted has changed the story in the past 6 months. But you are welcome to dispute the story just like you did in the prior threads. Back then you rather comically refused to believe comments from top Airbus executives. A simple stretch of the A321XLR would not have to have the new wing that was proposed for the A320neo+. It could use the existing A321 wing just as the A321XLR will. That would trade off two disadvantages -- low wing area and low native fuel capacity requiring the extra weight of an ACT -- against the advantage of much lower development cost. Just to explain, the current way the A321LR carries extra fuel is neither weight nor space efficient in the ACTs. Everything I'm reading is fix that first and a small MTOW increase to use that extra fuel volume. I come up with saving 500kg+ of weight and increasing fuel volume. It's NOT about the purchase price. Buying new airplanes is less than 10% of an airlines budget. It's about fuel costs. That's 50% of an airlines budget! An A330-800 has about 50% more structure to hold in the air, and therefore burns a lot more fuel. An A330-800 has about 33% bigger engines, and therefore burns a lot more fuel. Summary: At flight ranges suitable for the A321, the A321 is a lot more efficient. Huge more. Best post of the week! Could there be a 4T MTOW bump? You'd have to assume the A321neo is a well optimized design, and was not carrying a lot of weight. Also, there have been previous MTOW bumps that use available margin. My fear would be that one would need to strengthen the gear a little bit, the brakes somewhat, the wing just a bit, etc. My fear is that lots of components would need to be slightly changed, and that would cost $$$$. It might be better just to keep the MTOW as is, and accept more range penalty. As you note, the A321neo has way more than enough range to do any reasonable intra-continent route. Once you have London-Moscow, Hong Kong-Toyko and Miami-Vancouver, you have enough. except boeing has the cash flow to easily develop new products, airbus doesnt have that same financial freedom. and if there are 2 clean sheets nb replacements, they'll both be successful. the idea that only ab can develop and build good new planes and vice versa is so weird to me. but why would they, for basically the same price, can develop a much more efficient clean sheet? theres a reason the usaf always ignores people who want to restart f22 production, barbecue at that point you might just develop a newer plane. For what it's worth, TAP's CEO stated when they ordered the A321LR that on their TATL routes, 2xA321 would be cheaper than 1xA330. Because all those so-called specs are more speculations than specifications. Boeing has been mute on the subject for years, and will remain until they decide to launch it. Was supposed to be in Farnborough 2018, did not happen; now said to be in Paris 2019, we'll see. Do you want to start on this Boeing stands financial better than Airbus? In the beginning of this year people pretty much knew for sure the 797 would be launched at Farnborough 2018. What is it this time, Le Bourget 2019? I believe it when it is launched. For some time now, I've sensed something vaguely familiar about the NMA business case and the battle lines being drawn between B and A. Then it hit me........ This feels like a modern day equivalent of the battle between the Lockheed 1011 TriStar and the McDonnell Douglas DC-10, which commenced in the late 1960's. While the NMA is shaping up to a larger market, somewhat different range, payload, operating characteristics, etc., the battle seems very similar. Hopefully, this new battle will bring more airline customers to the table and will bring greater financial success for the manufacturers!